As mentioned previously, Radley Parish Council is leading the production of a Neighbourhood Plan for Radley. Once formally adopted, this will be part of the statutory planning framework, and will help to shape future development in Radley. The draft plan has a section devoted to Thrupp Lane and the Radley Lakes area west of the main railway line. The overall strategy is try and address the traffic problems in Thrupp Lane (by creating a new access onto Barton Lane or Audlett Drive for industrial traffics), and to see the Lakes as an area which could be given over to nature conservation and quiet recreation. The co-operation of the landowners will of course be central to this. 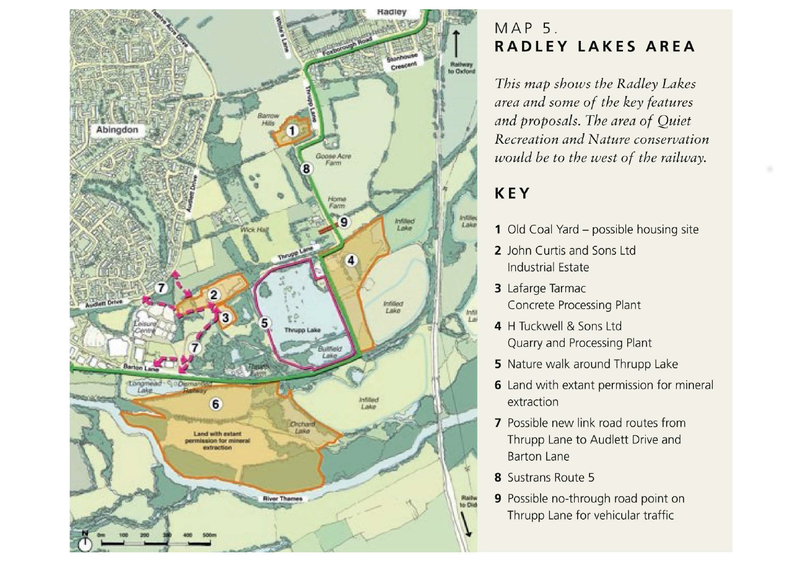 The map is of the Radley Lakes area showing possible new link road routes to Audlett Drive and Barton Lane. These are red broken lines marked 7.